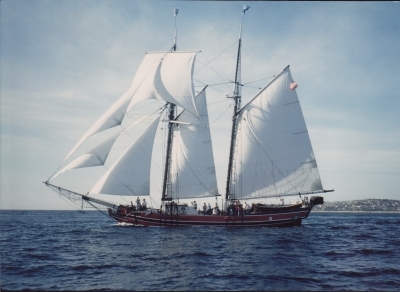 The Back Story: Swift of Ipswich, which is currently owned by Los Angeles Maritime Institute, is a topsail schooner. Some might say she is a true American classic — and they would be right since Swift of Ipswich is modeled after a notable boat sharing her name. Built as a replica of an American privateer (also named Swift) captured by the British Royal Navy during the Revolutionary War, Howard I. Chapelle designed her and she was built in Robinson’s Boatyard in Ipswich, Massachusetts. Beginnings at Robinson’s Boatyard: William A. Robison was an accomplished boating engineer from Kenosha, Wisconsin. At the age of 25, Robinson sailed around the world and then he ran his business Robinson’s Boatyard in Ipswich, nestled along Fox Creek, which filled rapidly and allowed for vessel passage. Some say this route was used as early as the 1600s. A notable boatyard, the onset of WWII lead Robinson to begin building minesweepers and a landing craft in preparation for D-Day. Swift of Ipswich was built for his personal use as originally the boatyard specialized in building wooden boats before the war. After a bitter divorce, Robinson abandoned his boatyard and moved to Tahiti; there is not much left of it, but Robinson’s Boatyard site is considered a historical landmark and can be visited today. A Slice of History: In the 1950s, James Cagney, an American actor known for such movies as “Yankee Doodle Dandy” and renowned for his dancing abilities as well as his recognizable New York accent, purchased Swift of Ipswich to use as his personal yacht. Cagney moved the yacht to Newport Beach in 1958, using it for harbor cruises and the like. Around that time the ship was featured in a number of films as well. Retirement: Swift of Ipswich was acquired by the Los Angeles Maritime Institute in San Pedro in 1991 and eventually became a part of the institute’s TopSail Program, which allowed students with learning disabilities to facilitate hands-on training to “become healthy, productive adults.” Though her days setting sail are no more,Swift of Ipswich has seen some of her most impressive duties helping to train at-risk youths. Obstacles and the Race to Save Swift: Capt. Bruce Heyman, the director at Los Angeles Maritime Institute, told The Log, “We were making great progress from about Dec. 1 2013 until Feb. 15, 2015. At that time we ran low on funds and had to deal with the financial reality of our core business … Right now, we are working to raise $550,000; that is our current estimate to complete the job. Once we have those funds, we expect we would be able to complete the restoration in 18 months.” To learn more about Swift of Ipswich, please visit lamitopsail.org.